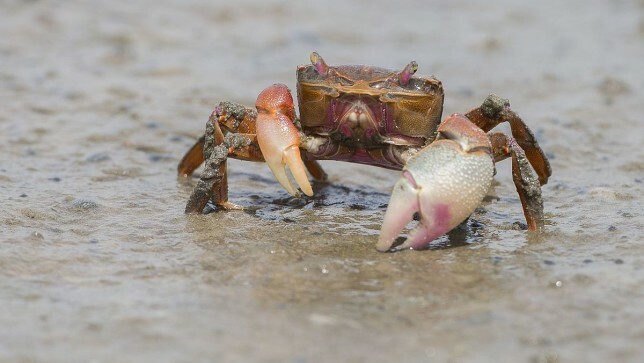 Argentinian researchers have discovered that both glyphosate and glyphosate-based herbicides affect the ovarian growth in crustaceans, during new peer-reviewed in vivo and in vitro studies on the model species – estuarine crab Neohelice granulata. Crustacean reproduction is a complex process, which implies the ovarian growing in adult females during the critical period previous to spawning (named as a pre-reproductive period). During this period, the immature (previtellogenic) oocytes develop into mature (vitellogenic) oocytes, which accumulate a large amount of yolk (e.g., lipoproteins constitutive of the vitellum), which is in part synthesized by the same oocytes. Besides, this process is regulated by several hormones, some of them secreted by the nervous systems (e.g. neurohormones) and others by specific endocrine cells, located in several tissues including the ovary. Glyphosate is currently one of the most used herbicides worldwide, especially in countries where agriculture represents a major item in the national production of commodities, as in the case of Argentina. Recently, researchers from this country have characterized several effects of glyphosate, both pure and formulated, on the ovarian growth of the estuarine crab Neohelice granulata. This crustacean species has been extensively studied during the last 30 years, concerning almost all of its biological aspects; in fact, N. granulata has been considered a model species, representative a great number of crustacean groups. One of the assays made on the crab N. granulata was the exposure of females during winter, this is, the three months pre-reproductive period that the ovary needs to mature, before spawning during spring. At the end of the exposure period, a significant incidence of oocyte reabsorption was observed in the ovary of those females exposed to the glyphosate formulation Roundup Ultramax®, having a glyphosate concentration (as the active ingredient) of 0.2 mg/L, a concentration that can be found in the environment. Besides, decreased vitellogenin content by gram of ovary was also found in the same females. This latter effect was also verified in vitro, after incubating isolated pieces of the ovary with same the commercial formulation and at the same concentration used in vivo. Moreover, by means of evaluating the incorporation of a radiolabelled amino acid to the ovarian proteins, it could be established, by comparison with a control group, that a partial inhibition of the protein synthesis was the responsible for the decreased vitellogenin content observed both in vivo and in vitro. Is glyphosate, as an active ingredient of commercial formulations, responsible for harmful effects? In further assays, the researchers tried to elucidate the actual contribution of glyphosate itself, to the deleterious effects on the ovary of crabs, caused by the commercial formulation assayed. To this, a new in vivo assay was carried out during the entire pre-reproductive period. As seen with the commercial formulation, a significant incidence of oocyte reabsorption was seen, but at a higher concentration (1 mg/L). Taken together, the results obtained with both pure and formulated glyphosate, suggest the existence of some synergic effects between the pure glyphosate and the coadjuvants presented in the commercial formulation assayed. Pure glyphosate did not reduce the vitellogenin content by gram of ovary, but a new effect of the herbicide apparently masked in the commercial formulation due to the inhibitory effects that this formulation caused on the vitellogenin synthesis, was the increased size of immature, pre-vitellogenic oocytes, at the end of the in vivo assay. Both effects caused by pure glyphosate (oocyte reabsorption and increased size of pre-vitellogenic oocytes) were also corroborated by means of in vitro assays, exposing isolated ovarian pieces to a glyphosate concentration of 0.2 mg/L. The abnormal increase in the size of the immature oocytes was consistent with a possible endocrine-disrupter effect caused by pure glyphosate, likely altering the secretion and/or the transductional mechanism of one or more hormones controlling the ovarian growth in crustaceans. This hypothesis is currently under verification.